I had the same hats at my birthday party and the paper plates and napkins! That looks like a rocking party and one that anyone would want to attend. Hello Kitty always makes a party fun, so who wouldn’t want to go? Whoever planned it put a lot of time and effort into making everyone happy, and your rude comments don’t take any of that into consideration. How do you know that the man feels bad? He looks like he is having a good time. You could learn something from him! haha this guy looks real excited. That looks like such a dull party. Could this be Mr. Hello Kitty Hell in the flesh? That man looks like he’s counting the seconds until this farce is finally over. What a good dog! He’s comforting the poor man! Someone get that dog some bacon. Wow. 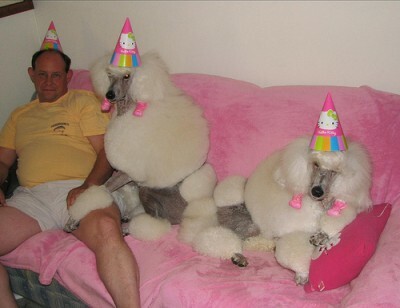 I don’t know what’s worse, the fact that those dogs are wearing HK party favors or the expression on that man’s face. LOL. This is a man in love.